dong ho eskapo: ever heard of this island? have you tried searching for an island through Google Earth and found something interesting and decided to explore it? i've been doing this in search for some of the best islands in the country. when i first saw this island, i was immediately drawn to discover it. here's a short series of a trip to an island less explored and often missed out town that's few miles off the shore of Luzon island. have you ever heard of Alibijaban island? looks like it's gonna be an interesting series. hmmmmm. Combing through Google maps for the prefect island getaway. Now that's a cool idea. 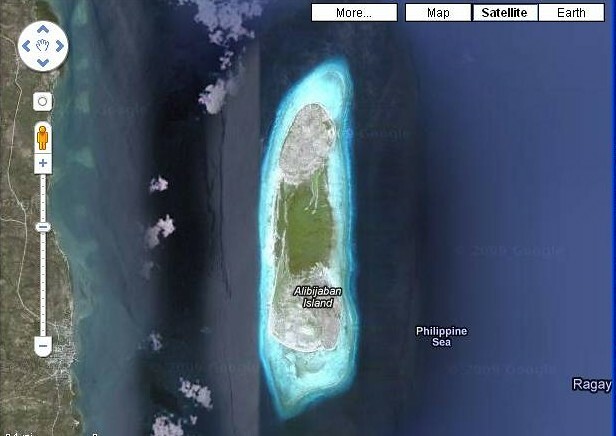 Heard of this island na, pero i ignored it! Never heard! But I am waiting with great interest your stories. that island looks freaking awesome! ganda kuya dom! Napagoogle tuloy ako bigla. :) Wow, your blog's url is truly living to its name. We learned something new. Wow another new island. So lovely that you have more than 7000 islands in your country. How many islands have you visited so far? iba talaga ang pag explore mo pards...isa rin ang kinagigiliwan ko sa pagpapakilala mo sa sariling lugar natin... nakatago minsan ang kagandahan ng kalikasan at lugar satin. at isa ka sa mga humahanap nito...salamat! omg, ang layo pala ng San Andres, Quezon. my ofcmate, who is from Gumaca, told me there are NPA's there. :p looking forward to your kwento! I would love to follow that series Dong... I hope it's something tourist would love to see too. are you going there?? bring me along!! wow! never heard! but then again, there are still a lot of unexplored islands. looking forward to it! you know i don't use google earth. so when are you going to feature this difficult to pronounce island. You capture the fun of searching in a lot of different ways. Wow! yup heard about it.. here.. =) wow, mapapa google ako nito, san yan? exciting, wait ko nalang dito..
Hindi ko pa siya naririnig..
naikwento mo na partially ito personally eh pero bitin kwentuhan kaya will wait for more of your adventure there. Virtual exploration is alive thanks to Google Earth. But I never heard of this island - sounds even alien for a Philippine island name, isn't it? google earth is amazing, isn't it?